Bet9Ja is an online sportsbook that has its license in Lagos and operates in Nigeria. The online sportsbook was launched in 2013 and has since then thrived to become Nigeria’s number one address for sports betting. Bet9Ja’s meteoric rise is best captured by the bookie’s traffic data over the last few years. In 2017, Bet9Ja was Nigeria’s third most visited website, behind Google and Youtube, topping global players such as Facebook or Twitter. Therefore, we decided to add Bet9Ja to our list of bookies to watch. claim your Bet9Ja bonus now! In our review, we tested Bet9Ja in terms of the bookie’s registration procedure and payment policy. We also took a closer look at the scope of the sportsbook and the respective betting options on the bet slip. While we will briefly discuss the bookie’s promo and bonus offers, we will mainly focus on the overall impression of the sportsbook. For an in-depth analysis of the bonus offer for new customers, we recommend you to check out our detailed Bet9Ja bonus review. The registration at Bet9Ja is fairly straightforward and follows the common procedure of setting up a betting account. However, in contrast to most online sportsbooks, Bet9Ja does not offer its services worldwide or across nations, but solely operates in Nigeria. Hence, for a successful registration, it is necessary to enter a Nigerian phone number when filling in the registration form. If you want to claim the Bet9Ja Bonus, you can do so by clicking on the bonus promo banner. This will redirect you to the registration form with the promo code field already filled in. To complete the first step of the Bet9Ja registration, you have to enter a valid email address. 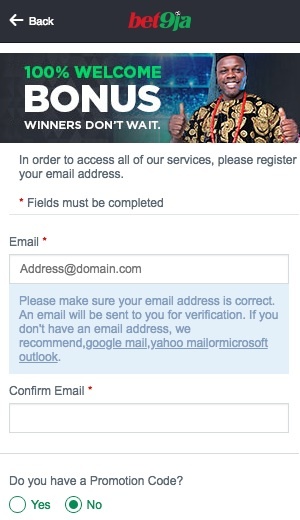 To proceed, you have to click the confirmation link that was sent to your email adress. This will take you right to the next step of the registration procedure, which comprises the usual data necessary to set the account up. This means you have to enter your name, username, date of birth, and most importantly, the state in which you reside as well as your phone number. As Bet9Ja is constrained to the Nigerian market, this obviously means the default options are limited to Nigerian states and Nigerian phone numbers. Once the registration is completed, you can proceed to making your first deposit at Bet9Ja. Bet9Ja offers a variety of payment options, most of which are bank transfer options. In contrast the majority of bookies on the market, instant bank transfer at Bet9Ja does not mean that you can use online banking surrogates to transfer money. A short walk to the bank is still necessary to deposit funds into the account if you choose this option. However, there are also options that allow for online payment, such as credit card or paycom. So overall, Bet9Ja certainly offers enough possibilities to top up the account balance. In total Bet9ja.com offers 13 different payment options for depositing and ultimately withdrawing money. For the some of the payment methods, different limits and fees may apply. Make sure to read the Bet9Ja T&C before making your first deposit. In terms of usability, Bet9Ja scores high. The homepage is well arranged and it’s easy to navigate through the bookie’s offer. 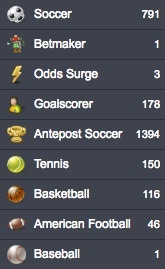 Top bets, upcoming highlights, and promo offers are placed at the center and the main navigation bar on the left. Account details can be accessed by clicking the menu button in the top right corner. Visually, the sportsbook reminds us of bet365 with shades of green and grey which is quite easy on the eyes. The live betting section offers different views (multi bet, event view, calendar) and some basic stats features, which should be sufficient to get a good impression of the live action and which team or player has the upper hand, and is more likely to score. Overall, we felt that it was quite easy to find our way around the Bet9Ja sportsbook. The only aspect that may allow for criticism is that the search function only works for team or player names, but not for competitions. For instance, if you search for the term premier (e.g. for premier league bets) you will not get any results. However if you search for „Manchester“ you get all the betting markets for the Manchester clubs. The Bet9Ja sportsbook offers 18 different sports categories and a few more special categories, such as politics, an odds surge category and the betmaker special. Overall, the bookie’s focus clearly is on football, which made up about 38% of the entire number of betting markets in our test. So, Bet9Ja is definitely a sportsbook where you can try out our football betting tips. But obviously soccer isn’t the only major category. Interestingly, betting on golf came closest with a share of about 28%, whereas tennis and basketball appear to be a bit neglected with a combined share of about 12% of the betting markets at Bet9Ja. As far as the depth of the sportsbook is concerned, we have good news. For most events in mainstream sports, such as football or tennis, Bet9Ja offers a solid number of markets per event. For example, for a Primera Division encounter between Barcelona and Sevilla we found markets for all kinds of outcomes ranging from scorecast bets to markets on the timing of the first substitution. The only category missing was goalscorer bets. However, these are offered in an individual category at Bet9Ja. Overall, the Bet9Ja sportsbook offers most of the well-established betting options and markets. However, if you are a fan of fringe sports, and you are looking for a lot of betting options there, you might want to turn to another sportsbook. In total, our review of Bet9Ja ends with mixed results. In general, the Bet9Ja sportsbook has a lot of useful features and covers a broad range of sports as well as betting markets and options. However, in comparison to other top bookmakers, Bet9Ja simply cannot keep up. The sportsbook is not very balanced with too strong a focus on football and golf, and lacks depth in fringe sports. If you are into betting on football, however, the bookie certainly offers a great deal of options there. 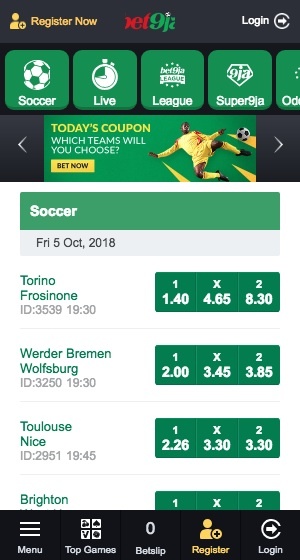 As far as the issue of usability is concerned, Bet9Ja convinced us with a very neatly arranged overview and a lot of useful tools that facilitate the navigation across the sportbook. We did not encounter any problems while testing the betting options and it only took us a few seconds to find the markets we were looking for in our test. The design is fairly straightforward and does not distract from the betting. As far as payment options are concerned, Bet9Ja offers a good variety of methods. Everybody should be able to deposit and withdraw funds rather easily.